You have problems functioning effectively at your job or school because of food and eating. STEPS TO RECOVERY: like all addictions your not going to overcome it overnight but if you fail to plan, you plan to fail! Step 1: ADMIT YOU HAVE A PROBLEM with food addiction. Until you are able to admit this, you will be unable to effectively treat the problem. When you notice that you would do anything to get the food you crave, even performing outrageous acts, it is time to face up to the issue at hand. Step 2: BE AWARE: sit down and make a list of you’re trigger foods (the foods you emotionally crave all the time even when you’re not hungry) and give it to your roommates or family. Fill them in on how those foods will sabotage your success if left out in the kitchen and ask them to either not buy them for a while or keep them hidden. If you live alone then there is no excuse. DON’T BUY IT. Remember out of sight- out of mind! Step 3: DETOX. Creating a structured clean diet is the first and most important step of recovery. Eliminating refined foods like sugars, flours, saturated fats, and even salt will be necessary, at least for a while. A new diet must be created that will only minimally include such foods, but in the meantime these foods need to be completely eliminated so that these substances stop hijacking your brain, giving you a chance to regain control. Step 4: FOLLOW A REGULAR MEAL PLAN. don’t have irregular eating patterns, or sometimes skipping meals, and then eating large amounts at weird times. A focus of treatment is developing a regular pattern of eating which includes 3 meals and 2 small snacks. Stop 5: DON’T BE TOO STRICT. 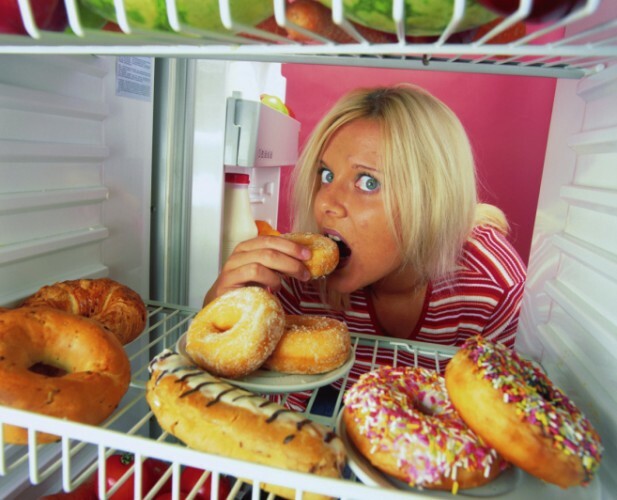 The deprivation and hunger of strict dieting can trigger food cravings and the urge to overeat. Instead of dieting, focus on eating in moderation. Find nutritious foods that you enjoy and eat only until you feel content, not uncomfortably stuffed. Avoid banning certain foods as this can make you crave them even more. Step 6: EXERCISE. Along with the obvious benefits, the natural mood-boosting effects of exercise can help put a stop to emotional eating. Step 7: DON’T GIVE YOURSELF CHANCE TO GET BORED. Instead of snacking when you’re bored, distract yourself. Take a walk, call a friend, read, or take up a hobby such as painting or gardening. Step 8: ADEQUTE REST; If you’re tired, you may want to keep eating in order to boost your energy. Take a nap or go to bed earlier instead. Step 9: LEARN TO DISTINGUISH between physical and emotional hunger. If you ate recently and don’t have a rumbling stomach, you’re probably not really hungry. Give the craving time to pass. Step 11: ACCEPT where you are now and constantly strive to be better then you were yesterday.